A UTAA gift continues the century-long tradition of alumni support for St. George campus. When the University of Toronto announced its plans to revitalize the historic grounds of the downtown campus, University of Toronto Alumni Association (UTAA) members were first in line to show their support with a pace-setting gift of $1 million to the Landmark Project. With the Landmark Project, the University is taking the bold step of returning the core of the St. George campus to pedestrians. 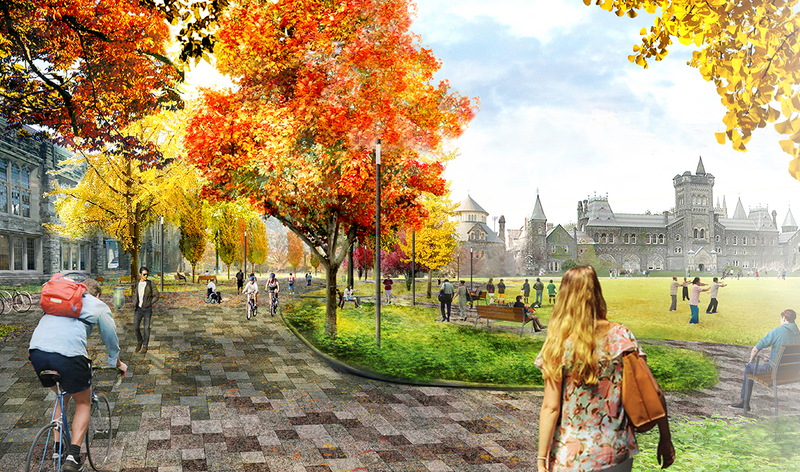 New pathways, gardens and multi-use gathering spaces, as well as the elimination of surface parking, will transform the downtown campus into a much greener, more accessible and socially dynamic place, while preserving the intrinsic character and beauty of one of Canada’s most significant institutional landscapes. The University matched UTAA’s $1-million gift, and by taking advantage of unrestricted donations to the Boundless campaign, was able to raise $2 million for the Landmark Project. When the project is completed, U of T’s historic core will once again serve as the thriving centre of campus, shaping and elevating the experience for students, alumni, faculty and staff members, and the wider Toronto community.